The IHE, located at the Campus South, and the IHM, located at the Campus North, are closely linked to each other. The collaboration in teaching and research started already more than 25 years ago. 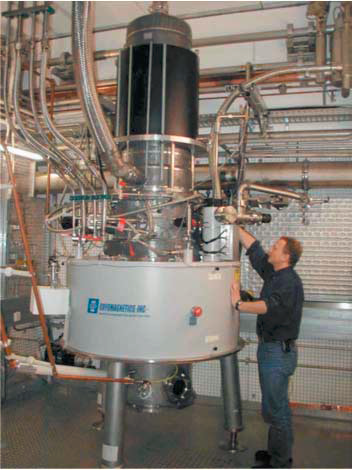 In frame of its research for the national Helmholtz research association the IHM is strongly involved in the research and development of high power microwave and sub-THz components, in particular for nuclear fusion and for material processing with microwaves. In frame of nuclear fusion, the IHM concentrates on the development of high power microwave sources (Gyrotron) and related components for the electron cyclotron resonance heating (ECRH) of future nuclear fusion reactors and related plasma experiments. Examples are Wendelstein 7-X, TCV, ITER and DEMO. In particular, the focus is on the development of the Megawatt class gyrotrons. The fusion research is ongoing in a European and worldwide community. In this large, long-term and important research project the IHE supports the IHM with it’s knowhow in millimeter wave measurement techniques, components and systems.